Chansons de Geste, or "Songs of Great Deeds," are the heroic epic poetry of the early European Middle Ages. The Chansons may be based on historically-attested figures, or they may be entirely fanciful; regardless, they are tales of kings, knights, ladies, battles, and chivalry. 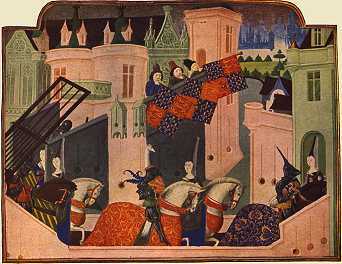 The best-known of the chansons is the twelfth century Chanson de Roland (The Song of Roland), the centerpiece of the story-cycle about the adventures of Charlemagne and his knights or paladins, called "the Carolingian Cycle" or "The Matter of France" (as contrasted to tales of Arthur and his knights, called "The Matter of Britain"). In the latter decades of the chansons, southern France saw the first flowering of the trouvère or troubador, and the idea of Courtly Love, wherein the knight's selfless service to his idealized lady replaced prowess in war and heroic deeds as the focus of the story. The Chansons de Geste, dreary and monotonous enough to our impatient modern sense, yet often redeemed by a sudden note of rugged pathos, ... drag their slow length along through the twelfth and thirteenth centuries. Their language, so full of the rough gutturals of the North, must have been the despair of the would-be lyric poet; but farther South, where the sun was kind and life more gay and leisured, the lingua romana developed rapidly, and Provence probably had a flourishing school of poetry before the singers of Picardy and Champagne had learnt their art. The elaborate and chivalrous etiquette of Provençal society was reflected faithfully in the songs of the troubadours; it was a peculiarly artificial civilization with oddly candid immoralities, and in its poems there is often a comic contrast between the subtlety of the form and the naïveté of the subject. The ideals of knighthood and chivalry expressed in the chansons de geste and the songs of the troubadors profoundly influenced literature in the Middle Ages well beyond the borders of France, creating hero-tales entirely different from those that had gone before. The Art of Courtly Love at The Decameron Web, Brown University. A Chronology of Medieval Europe, part of Exploring Ancient World Cultures at the University of Evansville. Monarchs and Monasteries: Knowledge and Power in Medieval France, part of the exhibit Creating French Culture, at the Library of Congress. Troubadors and Trouvères, an excerpt from the Grove Concise Dictionary of Music, at the Classical Music Pages. Peirol's Vielle: instrumental participation in the troubador repertory by Joel Cohen, reprinted from "Historical Performance" by way of rec.music.early, from Greg Lindahl's website. European Middle Ages, an astonishingly thorough site, part of the World Cultures Homepage at Washington State University. Life in a Medieval Castle. Knighthood, Chivalry & Tournament Glossary of Terms, "a growing resource for students, re-enactors, and anyone interested in knighthood, chivalry, or the medieval tournament."